Hair loss is of deep concern to patients, mainly because of its effect on appearance. On rare occasions, however, areas of balding can signal malignancy. A 33-year-old woman was referred to our dermatology clinic because of a 15-year history of scalp eruption accompanied by intense itching and progressive hair loss. Previously, she was diagnosed with seborrheic dermatitis associated with female androgenic alopecia. She was treated with topical steroids for numerous years without improvement, except for transient relief of itching. Five years prior to her referral to our clinic, she underwent surgery for an in situ melanoma of the leg. Otherwise, her past medical history was unremarkable. Physical examination revealed moderate hair thinning of the frontoparietal scalp, a finding in line with the diagnosis of female androgenic alopecia (Figure 1). Numerous follicular-based, erythematous, scaling papules with overlying yellow to brown crusts were noted on the parietotemporal and vertex areas of the patient’s scalp, where hair thinning was striking. The interfollicular skin appeared atrophic, as a result of the prolonged steroid applications, but was without erythema or scaling. Areas of scarring alopecia were absent (Figures 2A and B). The rest of the examination was unremarkable. Laboratory investigations, including a complete blood count, a full hormonal and metabolic panel, antinuclear antibody levels, and the erythrocyte sedimentation rate, showed no abnormalities. The diagnosis of seborrheic dermatitis was questioned because the condition manifests with erythema and desquamation of the scalp and involves both perifollicular and interfollicular skin. 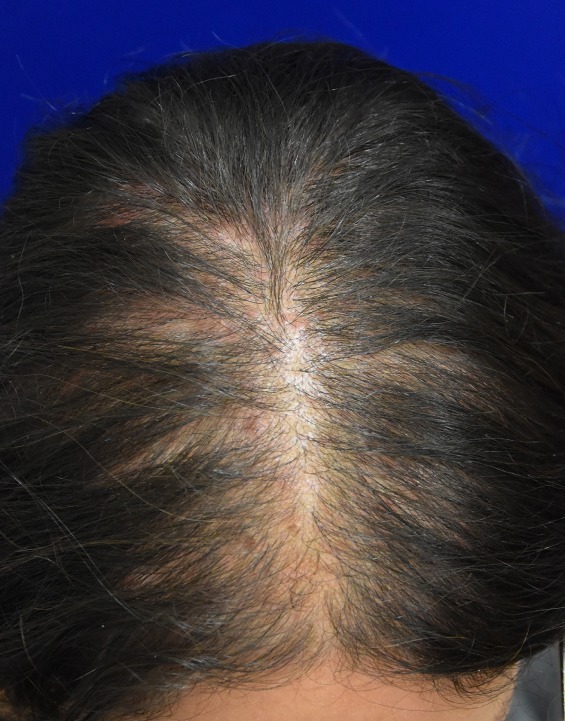 At the same time, the patient’s hair loss in the parietotemporal and vertex regions could not be explained by her previous diagnosis of androgenic alopecia, which commonly spares those areas in females. Thus, a 4-mm punch biopsy was taken from a papular lesion. 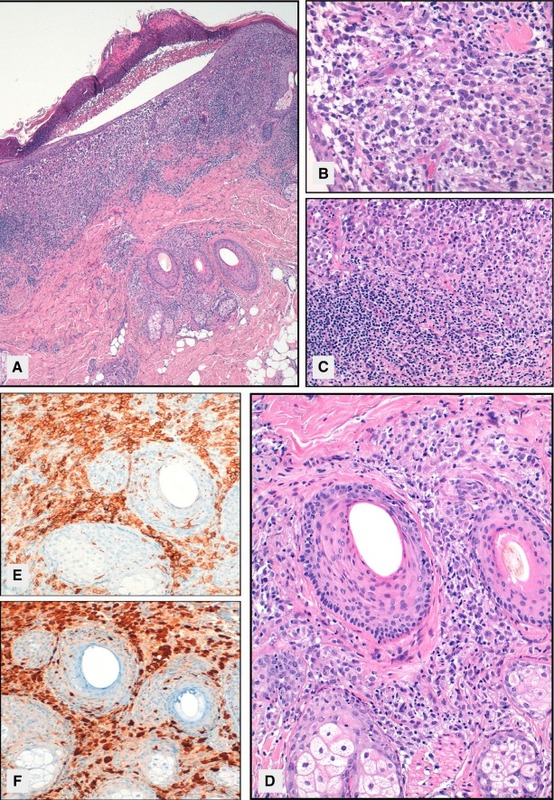 Histopathology showed dermoepidermal detachment and a dermal infiltrate composed of what appeared to be Langerhans cells, clusters and sheets of large ovoid cells with abundant eosinophilic cytoplasm, and a reniform nucleus. This accumulation of cells tended to have a periadnexal distribution, leading to follicular atrophy, and the accumulation of cells was mixed with numerous lymphocytes, plasma cells, neutrophils, and eosinophils. Immunohistochemical analysis produced reactions with antibodies against CD1a and S100 protein, confirming the presence of Langerhans cells (Figures 3A-F). Immunohistochemical analysis to detect the BRAF V600E mutation in lesional tissue was negative. Molecular analysis through mass spectrometry base sequencing (Sequenom Laboratories, San Diego, CA) confirmed the absence of the BRAF V600E mutation. This article originally appeared in the August issue of The American Journal of Medicine.